Due to the explosive growth of email data and evolving compliance requirements, companies are reconsidering their current approach for email archiving. If you are looking for a way to migrate data in a manner that maintains full chain of custody and meets regulatory and budgetary requirements, then PAMM is your solution. Whether you have undergone a merger or acquisition, have a need to upgrade your current archiving solution, or are making the move to the cloud, PAMM is the only solution you need. 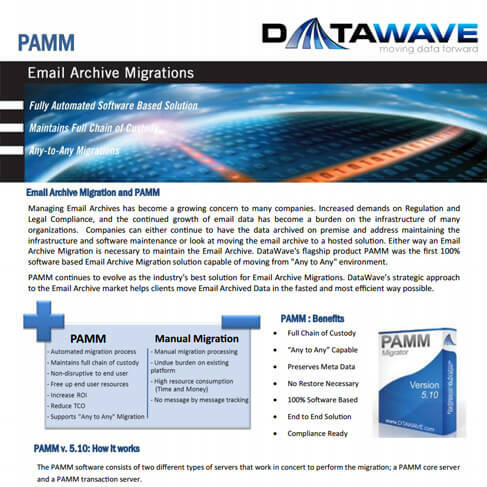 DataWave's PAMM is the first 100% software based product for automating Email Archive Migrations. DataWave is capable of moving from any email archive platform (including Autonomy and HP products – EAS Zantaz, IAP, RISS, and Nearpoint) to Enterprise Vault and EV.Cloud. DataWave automates the .PST process to generate custom file sizes for EV.Cloud migrations. Pay for only the data you want migrated, pricing based on actual GB’s migrated. Supports moving Exchange Mailbox and Journal archives between EV environments. Full Preservation of Email message Data including meta data. Delivers chain of custody and reporting for legal compliance. Automated conversion to .PST, .EML, .MSG. Non-invasive to the IT Staff. PAMM radically changes the concept around data archive migrations. There is now a solution that allows companies to migrate their legacy systems in a confident, trusted, proven method that will allow them to retire their existing systems. 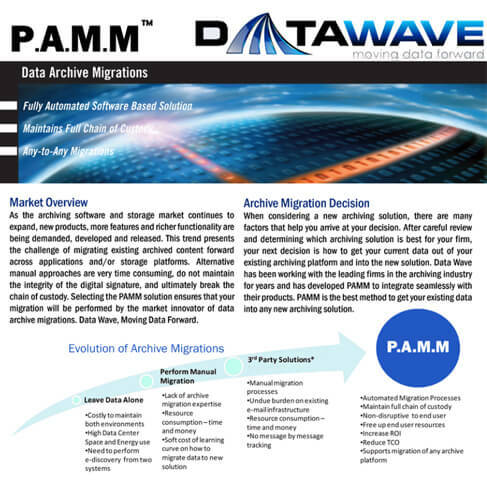 PAMM provides customers with the ability to migrate data in an automated methodology from virutally any archive storage platform or e-mail archiving application to another while maintaining full chain of custody through the use of Archive Transfer Modules. PAMM's Historical Data Recovery Archive Transfer Module is a software and services based solution developed and utilized to help companies address litigation and compliance issues. .PST/.NSF Ingestion Archive Transfer Module (ATM). 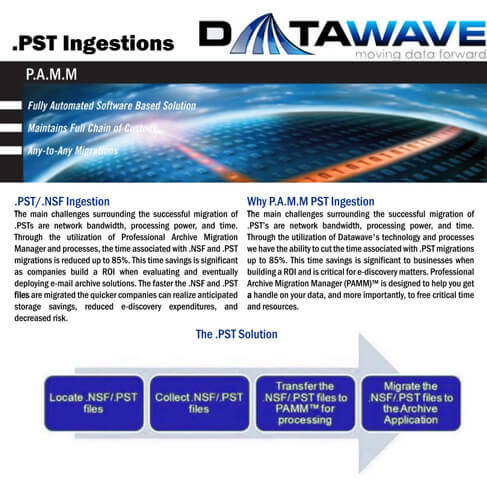 Through the utilization of PAMM's NSF and PST ATM, the time associated with .NSF and .PST migrations is reduced up to 85% and provides flexibility in managing the data migration. 32bit, 2x Quad Core CPU, 4 Gig RAM minimum, GigE, RAID, Windows 2003 and SQL 2000/2005. Microsoft SQL Server installation best practices are adhered to for local array/LUN separation of database, log, local back-up space. 32bit, 2x Dual or Quad Core CPU, 4 Gig RAM minimum, GigE, RAID, Windows 2003 R2 with Anti-virus. Additional application servers will boost processing speed. 1-3 TB of usable space if required to store archived objects temporarily. Full preservation of message content/meta data. Full compliance with FRCP, SEC, SOX, NASD rules and regulations. Complete end-to-end solution with automated processes, tracking, and validation Interoperability with major archive applications.